Rory McIlroy is incredibly smart. He is also maybe the most self-aware athlete in the world. And this is a problem for Rory McIlroy. When you are 22 and wide eyed with a swing that turns other pros (other pros!) into walking pools of gobbledygook when they try and describe what they are seeing, being smart and self-aware can't hurt you as much as it can when you're 29 and you've seen some things. When your game exists on the plane on which McIlroy's game exists, it's less important to have learned from your mistakes than it is not even knowing that mistakes exist in the first place. And thus is the curse of the gift. There are two mindsets beneficial to playing the best golf in the world, and being intelligent but self-aware is not one of them. If you're intelligent but lack self-awareness -- think Bryson DeChambeau -- then you're never hyperaware of your place in the world because you always presume it's at the top. If you're McIlroy, though, and you've already won four majors at age 25 and people start whispering about history, it's easy to start thinking about the end first. How many majors will I have at 35, 45? You can start to care a little too much when being one of the best ever is no longer a hypothetical that exists at the end of your swing but a reality that's unfolding in your life. And when it doesn't go your way -- because it almost never goes your way when it comes to golf -- that can start spiraling in the other direction primarily because you're intelligent and self-aware. This has always been an issue with McIlroy. It's as if all 50 of the top 50 golfers in the world think they're actually the best in the world, but the one who actually might be the best is the only one who's thinks, Yeah, with the game I have right now and the way I'm hitting my wedges, I'm probably about the 24th best. This is all relative, of course. Since his last major victory, Mcllroy has posted a career's worth of great wins. Someone else's career, that is ... not his. Those wins and this post-mid-20s Rory era have come with a disclaimer: Yeah, this is great, but you should see what he's really capable of doing. Sunday's win at the 2019 Players Championship was not a one-off victory for McIlroy. It was him doing what he's done all season with a win simply getting in the way of his play at the very end. It's certainly easier when the lion's share of your gained strokes come on Thursday and Friday as McIlroy's did, rather than trying to make up ground on the weekend when one is more likely to crack under the pressure of having to be perfect. But it was his sixth top-six finish in his six starts on the PGA Tour this season. Even though his putting was average, it was enough to beat the best field of the year. And here's a dirty little secret that people might not believe because we live in the "only winning matters I don't even want to discuss anything else" generation: McIlroy is playing the best golf of his PGA Tour career. To date, he has gained 2.74 strokes on the field per round in 2019 through 24 rounds. That's better than his career best of 2.41 in 2012, and it's better than the 2.27 he posted in 2014 when he won two majors and three straight events at the end of the year. "I'm comfortable. I'm very comfortable with where everything is," said McIlroy on Sunday. "And yes, confidence comes from that, or I don't know what comes first, but I've sort of simplified everything. "I go back to 2012, yes, I won five times, but I think I missed five cuts that year. [In] 2014, I had the wins, yeah. In terms of just the run of golf, I think this is the best start to a year I've probably made. ... I'm as confident as I ever have been with [the path I'm on]." Sunday certainly didn't start confidently. McIlroy began slowly with a double at the fourth hole, and he played the first eight in 2 over. Not good. But then three birdies in four holes gave way to the top of the board as he tried to hold off Dustin Johnson, Jon Rahm and Tommy Fleetwood. Oh, and then there was Jim Furyk. The 48-year-old whose swing looks like a drunk cop directing traffic made a late (and surprisingly saucy) move to get to 15 under. Around the same time, McIlroy shoved a 5-footer on the 14th hole for par, and gave Furyk and others the cruelest thing you can give in golf: Hope. Then Rory did what he does. He ripped down flags and obliterated atmospheres. An iron from the sand on No. 15 to 13 feet was sandwiched by a par-par close on the always-nervy final two holes. There were many tweets about the drive on No. 18, and it was no doubt a moment. But it was a different one in the middle of all of those that did it for me: a 347-yard drive on the par-5 16th. The hardest swing he took all week. It led to a birdie because shots like that on holes like this in tournaments like these don't lead to much else. When he eventually won, McIlroy didn't jump up and down. He didn't whoop and scream. He didn't rip his shirt off to reveal a "BEAT USA ... AGAIN" piece of artwork on his chest. He didn't throw the flagstick like a javelin at the Golf Channel set as Brandel Chamblee hollered about his right rough proximity to the hole and others went on and on about his inability to close. He just ... walked off the green and signed his card. It wasn't notable except that the two months leading into that moment were filled with seeming platitudes about staying present, about staying within the world Rory McIlroy has created. "I feel like I work very hard. I feel like I do all the right things," he said afterward on Golf Channel. "By doing all the right things -- winning this is awesome -- but it's a byproduct of the stuff you guys don't see, the practice sessions at home. Doing all the little things right. If this is what you get at the end of it, then it's all worth it." I was mystified by how little emotion he showed throughout the day and the week. We're talking about a guy who trash talks members of the media during Ryder Cups. But this week, it was as if he was just playing golf on a Sunday and a trophy was waiting at the end. Onto the next one. Don't get me wrong, I think he was measured and particular about shots he was playing and where he was on the leaderboard and what it meant when Rahm and Fleetwood found water on No. 11 and all the thousands of things that go into dissecting a golf tournament when you're in the middle of it. I think he wanted to win the tournament, but I don't think he was thinking about the end before the end got there. "I think [this win is] a little bit of validation knowing that what I've been doing has been the right thing and I'm on the right path," he said on Golf Channel. "Maybe with all these close calls I might have got here last year and been frustrated and tried to push too hard. I'm just trying to let it happen, and the more I can do that, the more I can be patient ... basically not let my golf scores define who I am as a person." He continued: "Sometimes, I've had that in the past where I see myself as the golfer, and basically the only thing that matters is what I shoot that day. That's not me. That's where perspective is huge. If I go out one day and shoot 74, who cares. I'll go back the next day and try again. Perspective has been a big thing for me." I've been critical of McIlroy in the past for being overly analytical about what he's doing off the course to help what he's doing on it. I've also been critical of golfers who don't find the pulse of a 72-hole event and can't understand the rhythm of peaking at the right time on a Sunday afternoon. The difference with McIlroy is that whatever he's reading or thinking about seems to be working, and you don't have to find a tournament's pulse when you're better than everybody else. This is what we've seen with Johnson, right? D.J. plays 72 holes, looks up to see if his name is above all the other names ... and that's the end of the week. If McIlroy can apply the right level of his intelligence to that ethos, the rest of the year could be a dream. 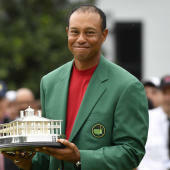 When he was asked at the end of a long night of media obligations on Sunday whether he felt like this win was an answer to everyone criticizing his closing efforts of late, McIlroy wouldn't bite. "I play golf for myself" McIlroy said. "I play golf because I love the game and I know that I have a talent for it and I want to make the most of it. So I'm just satisfied that I've added another great tournament to my CV, and it puts me in a great spot going forward." McIlroy, it seems, has stopped caring about trying to win a tournament on every shot he hits and stopped thinking about history. He competes only for the next Toptracer software-challenging 4-iron and the next drive Shotlink cannot compute. He is living within the present, seemingly shrouding himself from both history and the noise around him. And this is a problem for everyone else.